Verdict: 3.75 / 5This is a promising start to another section of the Dark Night: Metal series. 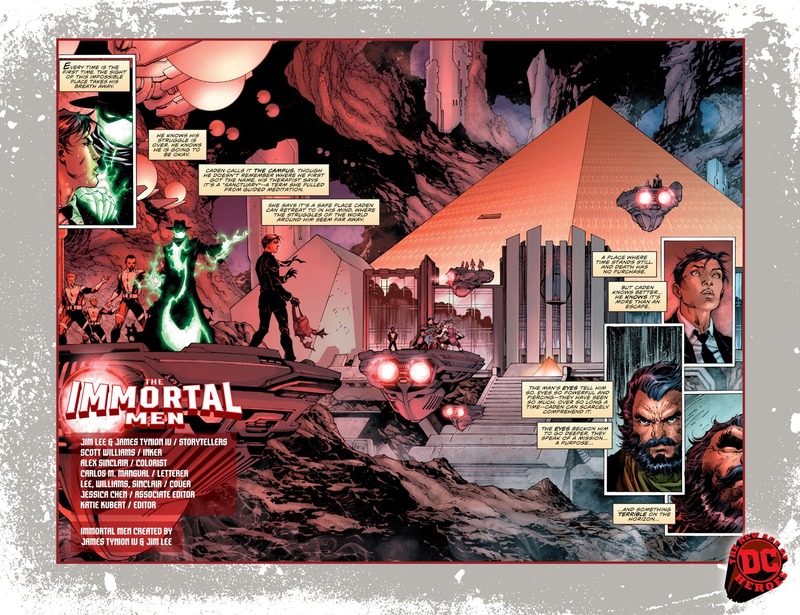 The Immortal Men continues on with DC’s recent Dark Nights: Metal series, introducing a whole new cast of characters for us to explore. The premise is interesting; a clan of immortal warriors sworn to protect the world from countless threats across endless time. The Immortal Men, as they are known, seem to have a sworn duty to protect. Set up by the Immortal Man himself, a longstanding DC hero, they appear to be at the end of their regime of heroism, but one boy may be able to save them and the world. We first meet with Caden Park, an unassuming kid who believes he has powers. His visions are a unique look at The Campus, a former home and school to the Immortals that dwelled there. His motivations are interesting although not entirely fleshed out. He has become carried away with the heroics of other powered people in his world and wants to make a difference with his perceived abilities. How he thinks he can go about this is not clear. With the power to see into people’s lives or perhaps minds, it’ll be intriguing to see how this kid can go about saving the Immortals. 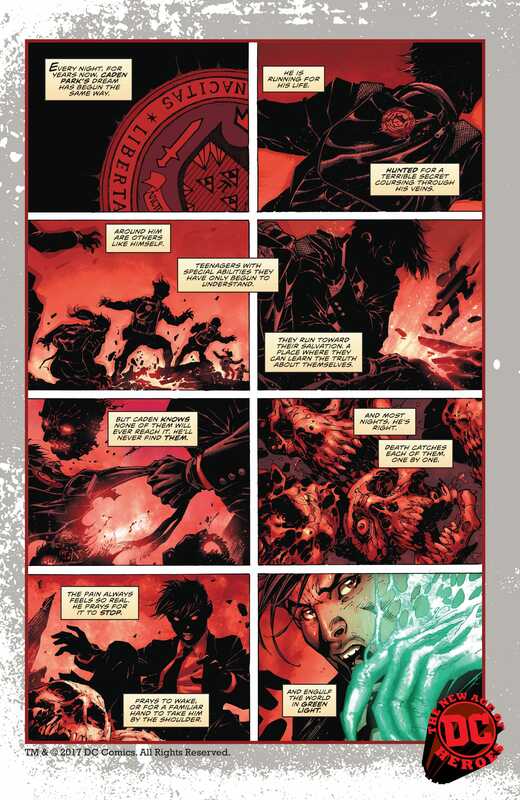 The Immortal Men are being chased down and wiped out by a trio of foes. The Immortal Man’s sister, a Hela rip-off known as the Immortal Woman, seems hell-bent on taking over Earth and ruling it as a goddess. She believes the Immortals are made for better things and should not be using their time and powers to protect an inferior people… well that’s what I got anyway, from the obligatory evil monologue. It’s still all sounding a bit Thor: Ragnarok, but she has her own sidekick that appears to support her on her mission. Not only does she have a legion of faceless monsters known as the Bloodless, but she also has on her side, The Hunt, a man who can hunt really, really well. Backing them up for emotional support, in a twist I genuinely did not see coming, is the Batman Who Laughs. He too believes the Immortals are destined for something better and clearly has a plan to twist this situation to his own advantage. A character that is already becoming quite popular, I believe this cameo will be a great surprise for many fans; Robin pets and all. With both the remaining Immortal Men and the Immortal Woman racing to Caden Park, we’re immediately faced with a showdown of our two sides. I did not know what to expect going into this issue, as The Immortal Men launches a lot of new lore, characters and locations. However, I think it did a phenomenal job of setting up the situation and the current world we are in and I’m interested to see some of the unexpected directions this story is clearly going to take. I believe the stakes are very real and, with a lot of lesser known characters, their fates are very much up in the air. All I know is that I’m going to continue reading on. Although the villains are one dimensional for the time being, I believe now that some of the explanatory content is out of the way, we can explore their motivations further. The tone itself is great also. From the start I felt there was an impending air of doom, hanging over our protagonists. The art is phenomenal and I really enjoy the creative team behind this book. The character designs are a little off in some cases (there seems to be a Valkyrie in the mix too) but, overall, this is a promising start to another section of the Dark Night: Metal series. Now that we’re past the exposition in The Immortal Men #1, it seems things are about to kick it up a notch.